Does one have it easier than the other? Anyone who has spent much time backpack hunting has probably had it happen to them. Hours of hiking with a heavy pack, clothes drenched once you hit the top, only to hear hooves coming down the ridge and look up and see another hunter with a string of horses, smiling from ear to ear. It’s part of the game of public land hunting. That being said, there are definite drawbacks to being the guy on the horse just as much as the one with camp on their back. Having spent 10 years running pack strings and guiding wilderness horseback hunts, I am a strong believer in the joy of using horses and mules to access the backcountry for hunting. But, nowadays, I spend far more time solo with a heavy pack on my back than I do in the saddle and I truly enjoy the simplicity. Let’s be honest, having horses enables you to comfortably access deep country, with ample gear and food. It enables you to be well rested for a big stalk every day, and enjoy the finer points of a bigger camp at night. Am I making you want horses yet? WOAH! They also have many drawbacks. If you aren’t familiar or comfortable with horses in the mountains, a fun hunt can quickly turn into a disaster. Horses will leave you. Give them the chance, and you might be walking home without them. They require water and feed, far more than you. They need to be your first thought in the morning, and at night before you think of taking care of yourself. Without proper feed and water a horse can develop colic which is basically a death sentence in the backcountry. Horses find ways to hurt themselves that can only make you wonder how and why. I usually carried a vet kit that weighed close to 20 pounds, and had to use it often. There are numerous things that can go wrong with horses in the mountains, so thinking that renting them and heading in deep and that all will go smooth is not something I would suggest if you have little to no familiarity with them. Now let’s try and forget about the hunter on the horse with T-bones for dinner and a lot more whiskey than you brought, and get back to enjoying your own two feet. With a pack on your back, you can go anywhere! No water? Bring it with you. Steep and nasty? Dig out a spot and sleep. It is far easier without 1,000lb animals at your side to enjoy the actual hunting aspect of a hunt. All you need to worry about is yourself, your next move, and what you might find over the next ridge. 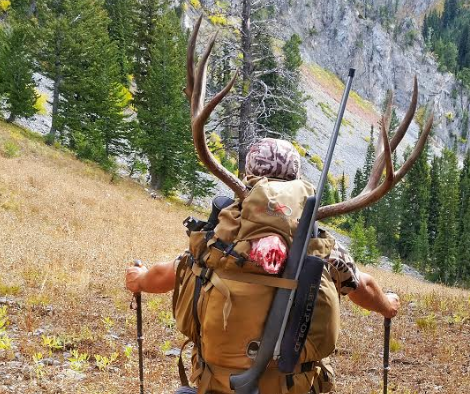 I spend basically every weekend, from mid July on, with a pack on my back searching for big bucks and bulls in the high country of western Wyoming. I could care less for horses for what I do. Yes, it would be nice to get a ride to the top, but once there I would hate to be dealing with them. Dealing with horses up there for multiple days, is not possible in most of the areas I hunt. Use the advantages you have as a two-legged machine to your benefit. When scouting and looking at areas, determine likely trails and spots where horse hunters will be accessing and camping, and then go elsewhere. One thing many horse hunters do, and I did it plenty, is ride by tons of great hunting country, with the intent of hunting deeper. There are great areas for elk and deer that will be ridden past in the dark by many horse groups, so utilize that. Just because they can cover a ton of ground, doesn’t mean they are looking at everything closely as they ride by. More than anything, enjoy the aspect of having no responsibilities aside from yourself, and wherever you want to go next. It would be easy to go on with both the positive and negative aspects to both styles of hunting. But, you don’t want to read a book. I can honestly say, if you have never experienced a true backcountry style hunt on horseback, it should be on your list of things to do. I love spending miles in the saddle with a pack string behind me. No matter if it is hunting season or a summer trip, there is no better feeling than covering ground with good stock. After years of doing it for a living though, taking the time to not deal with horses and focus on the simplicity of living out of a backpack in the high country is great and I look forward to it again this year. As I finish this up, the Wyoming draws have come out, and I managed to cleanly strike out all across the board, aside from a guaranteed late season cow elk tag, and as I head to the store to buy my general elk and deer over the counter tags like usual, I look forward to getting into the mountains on both two legs and four this season, because being able to enjoy the mountains away from the complexities of day to day life is something I crave and live for every day. So, whether you are the horseman or the backpacker in the mountains this fall, remember when you pass the other, we are all in there to enjoy the same thing, so no matter how you travel, enjoy it. 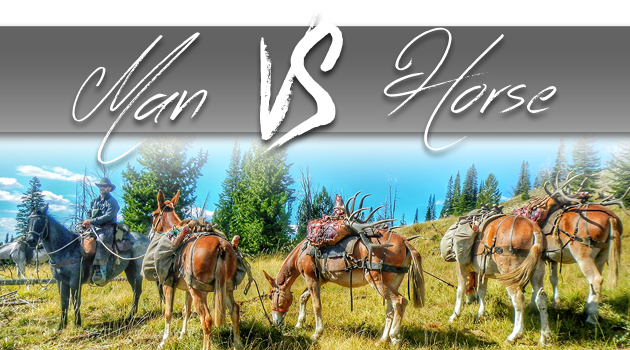 For anyone who has wanted to jump into backcountry horse use, or just learn a little more about packing and keeping horses in the backcountry, look into short packing courses or join a local backcountry horseman group. My friends Cody and LeRee Hensen of Royal Tine Outfitters and Guide School have taught backcountry packing for over 20 years, and now offer short weekend courses where all you need to do is show up and learn. For anyone hesitant about taking horses deep into the mountains, this is something that will truly give you the comfort and knowledge to enjoy yourself. The post Man Vs. Horse appeared first on Eastmans’ Official Blog | Mule Deer, Antelope, Elk Hunting and Bowhunting Magazine | Eastmans’ Hunting Journals. Previous articleStep 3- Gear UP!